Much like Schwarzenegger and DeVito in that one '80s movie, the words "healthy" and "ice cream" don't seem to make much sense together. But now, thanks to three brands of ice cream -- Enlightened, Arctic Zero, and Halo Top -- there is a way to eat the icy stuff without sacrificing your health. Each makes real-deal pints of ice cream, just like the mass-market producers at Ben & Jerry's, except these are low-sugar, high-fiber, high-protein, low-carb, and... surprisingly delicious. Below, we taste-tasted four flavors from each of these good-for-you ice creams, ranked the brands against each other in descending order, and then ranked their respective flavors within that. A ranking within a ranking. 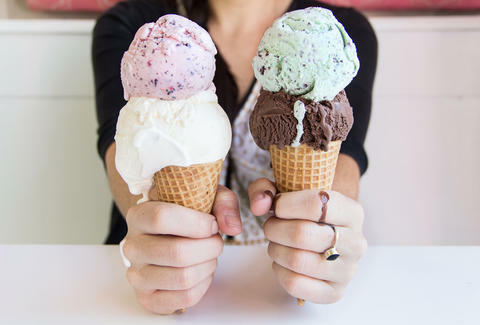 Disclaimer: This is not a review of dairy-free ice creams, since we did that already. So far, these three brands are the only nationally available low-sugar, high-fiber, high-protein pints. Yes, Edy's and Breyers produce no-sugar-added ice cream, but their recipes include maltitol syrup, which can have a laxative effect. We'll pass on that, pun intended. And Skinny Cow would've been in the running, but it doesn't produce pints, which is a real shame. Like the protein shakes all the cool people at your gym drink from comically large receptacles, Arctic Zero's pints all have whey protein concentrate as an ingredient. Unlike those protein shakes, purified water is the first ingredient in all its pints, which makes it less creamy and more icy than the other two brands I tried. Fun fact: it's also lactose-free. This tastes like the scratch-and-sniff banana stickers I plastered all over my bed when I was a kid. The vanilla wafer crumbles were a highlight, but not good enough to overcome the banana's artificial flavor. There's a peanut butter cup pictured on the pint, which is part of the problem here. You can't put the idea of a Reese's in my head and then not deliver Reese's-level chocolate-and-peanut butter flavors. The aftertaste isn't bad -- there are some stronger peanut butter/chocolate notes -- but there's barely any flavor when it's melting in your mouth. It made me want to get one of those 1lb packs of Reese's, eat everything within it, and really change the course of my day. It says on the label that this is a "chunky" ice cream, but it lacks chunk. I had to dig for a while to find anything, but when I did... beautiful fireworks went off in my mouth, just like the kind Katy Perry sings about. When you get to a chunk, pump your fist in the air -- they're the best part. The pint says it has "yellow cake flavor," and it delivers on that promise. 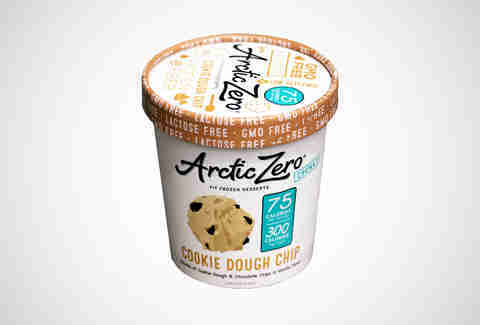 Somehow this is creamy, even though water is the first ingredient in every Arctic Zero pint. I kind of wanted to put a scoop of this on some cake, which would probably ruin the health factor. Give me a low-carb slice of cake and this is a helluva way to have dessert and not wreck a diet. Even though the company's been hawking its low-calorie, low-sugar, and high-fiber ice cream bars for a couple of years, the pints are a new addition, and are already a strong seller, according to the company. Other than a lingering mint aftertaste that isn't quite pleasant, this is a perfectly serviceable mint chocolate chip. They're not cheap with the chunks of chocolate chips throughout. If mint chocolate chip is your jam, you won't be disappointed. The caramel flavors are on point. The pint, however, was half full when I opened it. This is a problem I've had with a few pints of Enlightened, and the company tells me that the issue of half-filled pints was resolved in March 2016 (also, if you see one of these transparent containers half full on the shelf, buy it, and email the customer service team to get a free coupon for another pint -- that's a decent two-for-1.5 pint deal!). The ribbons of caramel are fantastic and plentiful in each pint. Not overly salty, either. Just a fantastic combo of salt and sweet, like the ice cream version of Titus and Kimmy Schmidt. I could kill a pint of this stuff easily it's so creamy and delicious. Enlightened absolutely nailed this flavor. This is the standout of the Enlightened ice creams available in my area. Rich chocolate flavors combined with sections of marshmallow make it feel like winter in your mouth even when it's 90 degrees outside. Ben & Jerry's (and every other ice cream company) should steal this flavor profile. 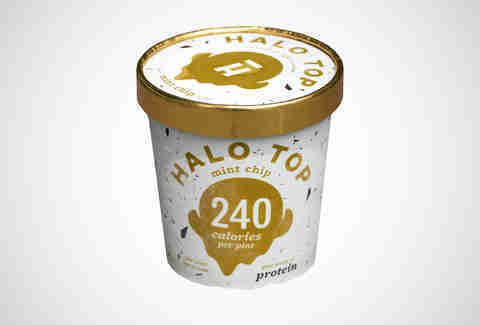 Like the other brands, Halo Top is low-sugar, high-protein, and low-calorie, but unlike the other brands, its ice cream is sweetened with organic stevia. And because growth hormones are for athletes to take in secret, Halo Top promises no synthetic growth hormones in its ice cream. Instead, milk, cream, and eggs are the top-three ingredients. As a huge chocolate and mocha fan, this is a swing and a miss for me. I got some coffee notes that didn't fit in, and it's somehow a little bit too saccharine for something with only 4g of sugar. A disappointment for me. This has a vanilla ice cream base and not a mint ice cream base, but it doesn't lack mint flavor, which comes through the second you bite into a chip. If you're a mint chip fan, I'd stick with Enlightened's version. Luscious, lemony, and creamy in a way that Enlightened and Arctic Zero aren't. I'm guessing that's due to eggs being second on the ingredient list. Bright lemon notes and a consistency that basically forces you to keep dipping your spoon in the pint over and over again. This tastes better than actual birthday cake, and that's saying something coming from a guy who really, really enjoys birthday cake. At first glance, my expectations were lowered significantly. It shouldn't taste as good as it does. Looking in the pint, there's a vanilla base with scattered colored sprinkles throughout, but then you take a bite, and those sprinkles burst with flavor. For the 364 days a year that are not your birthday, you can eat this and feel like it is, minus the disappointment you feel when your grandma mails you a $5 check again. You must be patient when eating this type of ice cream -- waiting at least 10 minutes for it to properly melt before you eat it is a must with all high-protein ice cream. Luckily it was chest day when I did this taste-test, so I banged out a ton of incline dumbbell presses while I waited, bro. Arctic Zero is perfect for people who are lactose intolerant, though even if you're not, the Cake Batter flavor is worth the money. 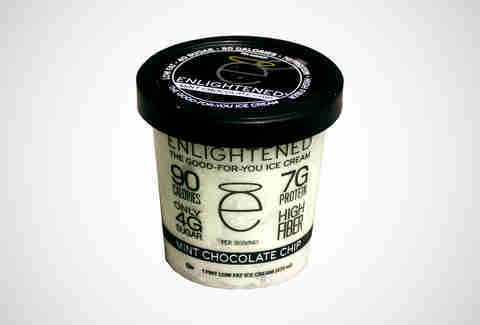 Enlightened has the most creative flavors for this specific type of ice cream, and Frozen Hot Cocoa is a standout. Halo Top's Birthday Cake and Lemon Cake ice creams were the ice creamiest of the cold treats I tasted (for you, I did this for you! ), which pushed it to the top spot. Lee Breslouer is a senior writer for Thrillist, and is going to take a break from ice cream for a minute. Follow him to birthday cakes: @LeeBreslouer.